Hey mama how are you? Did you have a good Mother's Day? Stefan really spoiled me by letting me sleep in an extra 3 hours while he took Jack. He came home with Starbucks and my present. My present was an 80 minute massage to La Costa resort and spa!!! DYING! Needless to say I feel like Jack and I really have to step up our game for Father's Day. I hope you got treated like a QUEEN on MD, and now is as good a time as any to get right into this recipe! I have been dying to share this recipe with you. I just have to start by saying that I LOVE donuts, like when I was pregnant I would buy the vegan donuts from Whole Foods daily. 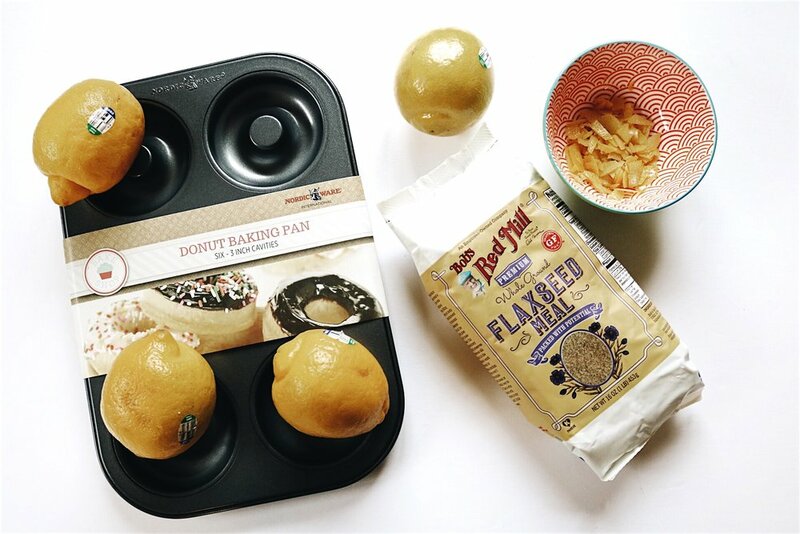 I wanted to make my own and I have really been loving the taste of fresh lemon in and on my food, so here we are making lemon donuts! Mix flax meal and warm water in a bowl and let it sit for about 2 minutes. Mix lemon zest, agave, flax mixture, almond milk, and vegan butter until combined. Add flour, baking powder, and salt. Mix until combined but don't over mix. Fill donut pan about half way with the mixture. While the donuts are cooling mix lemon juice and powdered sugar until all lumps are combined. Dip cooled cooled donuts in glaze and let excess drip off and place on a dry wire rack. Leave for about 10-15 minutes until dry and then eat.